You treated Kiddie – shown above, in July 2006. At the time she was about 17 years old, weighed in at around 7.5 lbs. , was weak, depressed, lethargic and sick from thyroid pills all the time. We thought she pretty much was going to be a goner by the end of last year. Our vet recommended your Radioactive Iodine treatment for Kiddie. After Kiddie returned home from your treatment and care, she was a different cat. She had strength to jump up on the couch, curiosty to explore, personality to talk back, and an appetite that was timely and normal. History: We only acquired Kiddie and Boo in 2005, after Mom passed away. Kiddie had the thyroid issue for some time – we were at a crossroads at the time as to what to do because the cats were old, and we traveled alot. 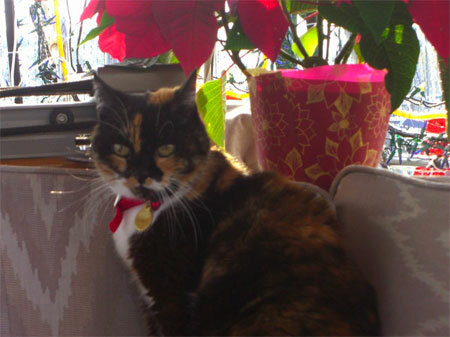 It was ultimately decided to take the cats and continue taking care of them – as Mom wanted. Well, now there like our own children and they travel with us. 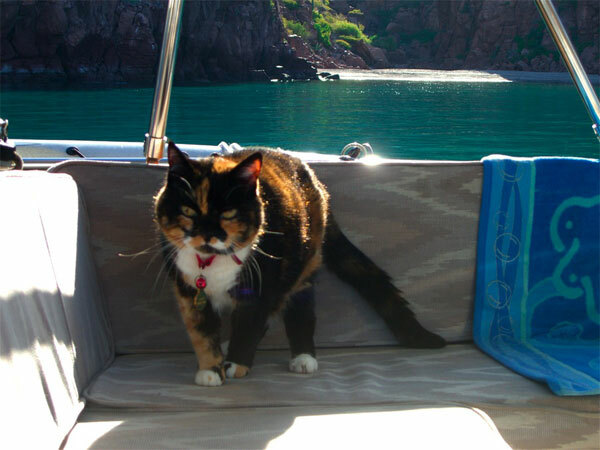 We have a 50′ Sailboat, which our two cats Kiddie and Boo spend lots of time on. Kiddie actually is able to climb up our companion way ladder (Boo is also), and hang out outside on deck – especially at night when all is calm. Kiddie now weighs in at a little over 9lbs, and talks alot. There are times when she grumbles at me when she doesn’t like her food – it’s hilarious! Just this morning, Kiddie was trying to stalk something – I’m not sure what it was – could of been a rock for all I know – but the point is . . she’s enjoying life. Thank you so much for saving her life. Her sister Boo, whom Kiddie’s never been apart from is very glad also and says thank you too. Boo is a 10lb Tortie, and is my reliable alarm clock every morning.